Contributing institutions can elect to provide descriptive information (“metadata”) for materials submitted for inclusion on DigitalNC.org. Information should be organized according to the metadata guidelines below and entered into a spreadsheet template which we will provide. Each field listed below includes a brief description and how it is to be used, as well as a Dublin Core mapping, if there is one. Note that only a few fields are required. Providing Date and Location information greatly improves access to your materials. Title Required. A name given to the item. It is up to the contributor to decide how much information to include. Creator Institutions or individuals that created or assembled the item. Names should be taken from the Library of Congress Name Authority File (LCNAF). If the name is not listed there, it should still be listed in LCNAF format. Publisher Institutions or individuals that made the original item available. May include a name and location. Description Narrative description of the item. This free-text description can be as short or as long as necessary. Date Point or period of time associated with the creation of the item. This date field can include both words and numbers as necessary. For example, “circa 1950”, or “between 1980 and 1990”. Date (numeric) Point or period of time associated with the creation of the item. This date field can contain numbers only and will be used by the system to enable searching and sorting by date. If you know specific dates (as opposed to just years), list them in year, month, date (YYYY-MM-DD) format. Location This field should list the location depicted (if the item is an image) or the location from which a document or publication originated. Contributors are strongly encouraged to list the North Carolina county, whenever known. Subject (Topic) Topical subject terms that describe the item. Use Library of Congress Subject Headings (LCSH). Subject (Name) This field is used for names of well-known individuals or institutions. Names should be taken from the Library of Congress Name Authority File (LCNAF). If the name is not listed there, it should still be listed in LCNAF format. Subject (Images) Topical subject terms that describe the image. Terms should be taken from the Thesaurus for Graphic Materials. Subject (Local) This field may be used for terms created for specific institutions and/or projects. Type Required. The nature or genre of the original item. Use the Dublin Core Type Vocabulary. For photographs, the term “Image” will always be included in this field. For text-based items, the term “Text” will always be included in this field. Format Required. Describes the specific form of the item. Use the Art and Architecture Thesaurus. Contributors are encouraged to use the term “Photographs” for all photographic prints, as well as more specific terms when appropriate. Language Language(s) of the original item. Dimensions Size of the item. The dimensions used are up to the discretion of the contributor. Digital Collection Required. Name of the digital collection on DigitalNC in which the item will be included, for example “Images of North Carolina” or “North Carolina Memory”. Contributing Institution Required. Full name of the organization that contributed the original item. Collection in Repository The name of any larger collections of which the item is a part. Item/Call Number Any call number or item number associated with the original item. Rights Statement Required and provided by NCDHC staff. Statement describing what is known regarding the rights status of the item. Statements will be taken from RightsStatements.org. Usage Statement Any additional information that describes usage conditions of the item. Contact Information Required. Contact information for the organization that holds the original item. Contributors are encouraged to use general addresses, rather than contact information for specific staff members. File Name Required. The file name for the item being described. Description Making molasses in the Newfound Community. 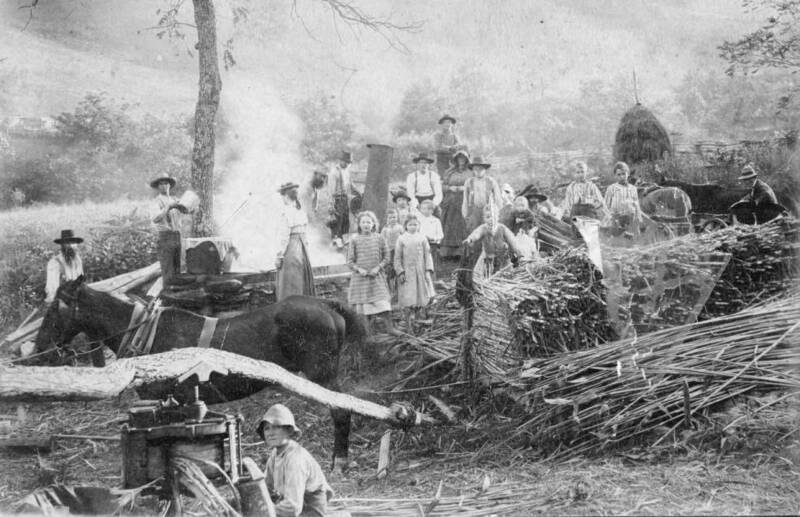 Subject (Topic) Sugar–Manufacture and refining–North Carolina. Subject (Topic) Education–North Carolina–Cumberland County. Subject (Topic) Fayetteville Technical Community College–History.